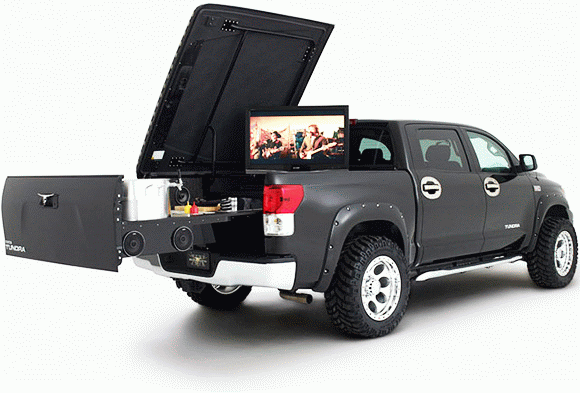 Looking for a really awesome outdoor entertainment vehicle? Here comes the Midnight Rider Tundra Tailgater. It was developed through Toyota’s partnership with Brooks & Dunn. As a tribute to the music duo’s large truck-devoted fan base, Toyota wanted to push the boundaries of bed utility and capture the imagery of the truck trucker. When you slide out the tailgate, exposing a BBQ grill, beer tap, ice chest, 42″ HDTV and Kicker sound system. The sound system features a dual subwoofer system and a separate amp, four two-way speakers with tweeters and separate crossovers, and dual two-channel amps with separate equalizers and speaker control units. If you want to see the Tundra Midnight Runner Tailgater for yourself, you can catch it sitting outside most venues on Brooks & Dunn's upcoming 2010 Farewell Tour. Showing off the vehicle in person at the 2009 SEMA Show, Ronnie Dunn joked that he and Kix Brooks were going to fight over who gets to drive it to each city. Whoever wins, they'll definitely be riding in style. This tailgater could be perfect for friends night out, or camping with family and friends.